With one week to go before T-Mobile’s next Un-carrier move, CEO John Legere has dropped a teaser for the big announcement. The brief video shows Legere sealing a wooden crate that’s labeled “Decommissioned” and then wheeling it into a room that holds “Relics of the wireless industry”. There are references to things T-Mobile has targeted with past Un-carrier moves, like contracts, data limits, and taxes and fees. 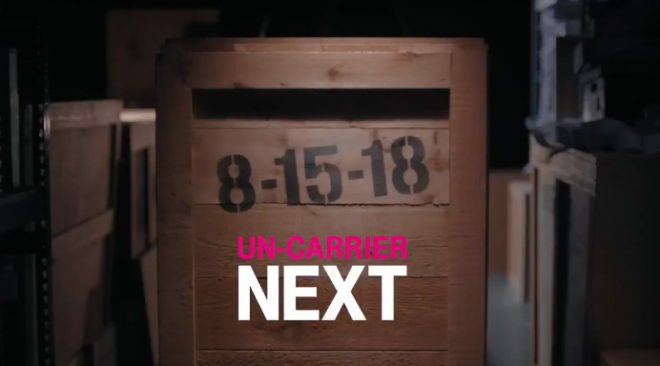 T-Mobile will officially reveal its next Un-carrier move on August 15th. Now that we’ve got this new video teaser, what do you think T-Mo is planning to announce? Huh. The new Essential plan has taxes and fees. So much for that, eh? I get it, and I am on ONE, but honestly; if they’re gonna brag about it, it should apply to all their plans. Of course, they were also bragging about having only one plan when they launched ONE…guess that didn’t last long either. They really don’t care about single line customers. It’s not where the money is. In fact, as a single line customer, the last thing I would be using is one of the “Big 4” (soon to be 3?). Can I ask why you’re on T-Mobile with just one line? There have got to be better options on MVNOs out there, I would imagine. As a T-Mobile rep, single line activations are very important to us. We care very much about all of our customers, single line or family plan! That said, I do love you guys. There’s two stores in town and ya’ll are a joy to come in and get upgrades/accessories/etc from. Heck, I do it enough at one of the stores that they recognize me. Never had that kind of service at any VZW location when I was with them back before “uncarrier” and all that. I ask this question few times on here,no Tmo rep ever answer me,maybe you will,what does Tmo do with all the phones that are return to them? They have hardly have any use phones for sale on their site,why is that? The only one which is cheaper I have found is MetroPcs. Couple of times I almost pull the trigger,but change my mind. One reason is this,Tmo has unlimited tablet plan which is great for $75.00 an month,but if you have voice plan it goes down to $25.00 an month,plus auto pay which knocks off another $10.00. I look at all of the big 3,none of them have unlimited tablet plan. Like other have mentioned the tethering too. Do T-mobile employees work on commission? If so, judging by what is written on all the crates in the warehouse, maybe that’s what Legere wants to get rid of. Single line customers aren’t as important. When your contract is up (or phone paid off) you are able to move to another carrier. With families, it’s such a hassle to switch that once they get you they know they have you for a much longer period. Plus it helps them get a leg up on the next generation. “I think” with Teltik you get ALL Tmo features at a lesser price…just no phone installment benefit. If NOT, no one else matches Tmo, plus what you say,”the savings not worth what you lose”. I check out Teltik,it look like it is only for business,I didn’t see anything about non business,but I could be wrong those. 1. No more soft data cap(or say, a 100gb limit). 2. No more Hotspot limit(up until the present 65gb data cap). The take could be data speed tier / limit once you surpass the limits– like in the days of HSPA & 4G LTE. Or it could even be zero caps whatsoever, but at a lower speed…say 10/20mb…further possibly limited to 720p only. I would like to see the end of having to pay extra for phone insurance and/or eliminating high deductibles. That I would not miss at all. People are still paying for phone insurance? Just get any Wells Fargo credit card, use it to pay your phone bill and you can get up to 4 lines/phones covered for up to 2 incidents per year (not per phone) at only $25 deductible up to $600 coverage per incident. Very easy to use – have taken advantage of it 3 times in last 2 years for cracked screens or water damaged phones. I dare to dream! Thanks for the tip about coverage through credit card, going to look into that. The recently announced Essentials plan is NOT what I’d called “Un-Carrier” since it does not include taxes/fees, contrary to what TMO has been bragging about itself. 1. No more pathetically slow domestic roaming. Full speed LTE roaming with no limits. These roaming areas are very prevalent throughout central PA, VT, NH, and Maine. 2. Refarm ALL 2G/3G spectrum to LTE. T-Mobile is talking about 5G, come on now, it’s time to get with the times. AT&T got rid of 2G. Verizon will go all LTE/5G by the end of 2019. 3. HD Voice Interoperability between all carriers. Verizon and AT&T do it. Hurry up T-Mobile. This one should have been done long ago. 1. Not going to happen unless Tmobile wants to pay the big bucks to Att (maybe Verizon?) for their access to roam on their LTE network. (Might be cheaper to just build new T-Mobile towers). Plus In those states you metioned I believe you already get full high speed LTE roaming access onto the USCC network. I had it in WV but i’m not sure if the states you mentioned are in USCC’s territory. 2. Yes, yes, yes! It’s time to kill 2G/3G, we’re talking about 5G and there’s still 2G Edge out there! Until every cell tower has low band 600/700mhz AND either a high/mid band 2100/1900mhz mixture, tmobile will not compete with Verizon or Att on coverage/speeds. 4. Absolutely do not remove the limit. At times when the network is congested, they have two options: Slow down only users who have exceeded a rather generous cap (50gb) Slow down EVERYONE in the congested area. Which approach seems fairer? 5. You answered your own statement. Maybe when 5G launches they could try that but they cant do that now when LTE has times of congestion. Already have it with the Plus International addon. I use it religiously for my Chromebook when I am out and about. Wow that’s not much to ask for. What not add a free new phone every year also? Decommissioned, and no one is going to miss this… the only thing I get out of that weird Warehouse 13 type of promo video is that they are decommissioning parts of their network to recycle it for LTE. Which wouldn’t make sense to customers unless its business customers they are moving to their narrowband LTE they just launched. Id love to see them get rid of 2G/3G but that wont happen overnight. Plus is that really worthy of an uncarrier announcement? I’d be good if the “relic” is any data limit on the older Simple Choice plan. Everyone with 2gb, 6gb, 10gb, automatically get upgraded to UNLIMITED data for free! At end of Feb 2019, those of us who have lines that were bumped up to 4gb/mo for free from the standard 2.5gb per month will revert back. Why not unlimited. Free. Those plans are grandfathered and I doubt anymore freebies will be given. They want them to move to one plans. I agree 100%, but we can only dream…. Or: Simple Choice is being decommissioned. Everyone will move to One plan. Or maybe Legere shaved his head, and the box is full of his hair. If T-Mo kills off SC and moves them to One, there will be a lot of angry riots at T-Mo stores! I have 8 SC lines for $120 (including two free lines from the 2015 Black Friday give-away). I think the key phrase and clue that everyone is missing the point is “…not buy them.” Clearly they are getting rid of something that another carrier purchased (obv in error or that made the carrier worse for the customer). I’m having trouble figuring out just what that is, but given ATT is usually in Legere crosshairs could it be something TV related. Or is it Verizon? That would be a nice thank you, to old loyal customers. Yeah that’s affordable for them. Give away stuff to everyone with no strings. Per Mike Sievert in a recent tweet, “The last time I experienced this latest soon-to-be relic, I actually was worried my face might melt off. 8.15.18” So what what would someone be worried about that their face might melt? Considering the video is a nod to the original Indiana Jones film at the end where the Ark of the Covenant is stored in a top secret US Area 51 type facility. Earlier in the film, those responsible for finding it opened it which resulted in face melt. I’m intrigued by the imagery evoked in the tweet & video. Certainly a reference to something held by believers to be a most holy object, in this case, the wireless industry. If that holy object is in someway mishandled, could that be what Sievert refers to as a punishment for a blasphemous act? What could be so blasphemous in the wireless biz to trigger such a reaction? I’m believing Legere is taking aim at Blue’s purchase of Time-Warner/DirecTV. The blasphemy is giving away something that normally is monetized. Could we see a Layer 3 skinny bundle w/ a ONE family plan? Yeah, scene for scene recreation. Cable TV is as a relic as they come so I think you are right. Having said that, I am skeptical. For one thing, Layer3 is incredibly expensive at $75. I am sure T-Mobile acquired Layer3 to make it more competitive, but how low can it go without drying out the bank? Majority of the cable channels are owned by competitors (either direct or indirect). Even if T-Mobile decides to make zero profit, I suspect $20 is the lowest it can go. And I am not sure most of us will be jumping for joy even if it is unveiled at starting price of $20. Concur on the cost. I read a story a month or so ago that Tmo was having great difficulty negotiating carriage agreements simply due to scale. Comcast’s size can get a deeper discount than Layer 3. The struggle going forward for a skinny bundle would be consumer cost. Cost of sales will rise considerably because John/Mike will never be able to get equivalent carriage agreements with content owners. In all seriousness, if Tmo wants to do a video bundle, I’d sniff around Sony’s backyard. Sony seemingly can’t market it’s Vue product so matching Vue w/ Layer 3’s distribution intellectual property could be a real hit. The other angle is Dish. Dish has the carriage agreements but the singular problem w/ Dish is our old buddy Charlie Ergen. Charlie has to be in charge and he negotiates carriage w/ an iron fist. As a former Dish customer from many yrs ago, channels disappeared because he refused to cave into double digit increases demanded by the content holders. Viacom is a notable example. Charlie also bellied up to the recent FCC auctions and bought a boatload of spectrum that has to get built and he’s quickly running into a deadline. It does not look like any extensions will be granted. I always thought John would offer to build out Dish’s spectrum in exchange for a roaming agreement plus access to Dish/Sling’s programming. That never happened, although I’m virtually certain some conversation did happen. Charlie just refuses to play 2nd fiddle to anybody and he would be seen as as exactly that. BTW, I’m still wondering if Ergen still has super voting majority control. Dish should be scared because it’s about to start losing its spectrum. The first cellular buldout requirement is in 2020 and it’s done absolutely nothing to meet it. No way T-Mobile could afford $20 per month… From what I’ve read, Google’s $40/month YouTube TV subscription actually costs them about $49/month. I think Layer3 has even more channels than YouTube TV, so it’d probably cost a little more… I doubt T-Mobile would go below $40/month. Probably at least $50. The biggest pain point, or relic of the wireless practice, is upgrading a phone. T-Mobile tried to alleviate the pain several times in the past, most notably Jump and Jump on Demand, but these Un-Carrier moves proved to be unsustainable and too complicated. I think the most straightforward example to date is iPhone Upgrade Program, offered by Apple, Sprint, and T-Mobile. Pay the monthly installment for 12 months (out of 24 months total), trade the phone in, and get the new phone free. I would like T-Mobile to take this concept, but bring it down for more typical buyers. Instead of new phone every 12 months, why not spread the installment over 3 years and let you upgrade every 2 years? For example, buy $1000 iPhone X now and pay $27.78/month. After 2 years ($666.67), trade it toward 2020 iPhone X. As a bonus, include protection plan. I hadn’t looked at that Layer3 website for a long time. Pretty sure the plan used to be $75/mo and now shows $89/mo for me. For 1 box! What a ripoff! Comcast is way cheaper (which is sad). Maybe they pumped it up to make it look like a better deal if they bundle it with some discount. It is NOT allowing you to order. It is allowing you to sign up for news about the release of Layer 3 TV with T-Mobile. Indiana Jones 5: Legere unwisely opens the Ark and stares at it. Twist, the Ark melts instead. What if they did away with data throttle? That would be insane. Wishful thinking of course. It may actually be this, as they have been increasing the network capacity and increasing the data from 22gb as it is right now to 50gb. That would be amazing and no one would miss this. Especially if this is the age of mobile and more and more data is being used. Tmo has been seeking home installation techs for the past couple months on their careers site. This is likely a local kickoff party. It would really be cool if someone close would go & report back. Jump on demand is going away because they lose way too much money with indecisive people changing out their phones all the time. Smh. Just get the phone you really want after doing research on the phone. Biggest pain point is paying for phones,maybe it is free phones if you are with Tmo for 2 years or more! LoL! Good one! That is a pain point those! I have a gripe, but its not necessarily in T-Mobiles control. How about all the carrier bloatware/carrier branding/ and lack of updates on Android devices. If Apple can tell carriers NO, then so can google and all the other device manufactures! I want them to fully cover the ZipCode in which I live, 85634. The maps lie. Coverage is spotty at best and then only within site of the towers. I thought they were going to match Verizon’s geographic coverage by the end of 2018. We’ll see. I noticed a discrepancy with their coverage map and actual service as well… I was traveling through a couple small towns this weekend and had no coverage (voice or data) even though the map says I should have had fair 4G LTE – and even had several “verified by user data” markers. I clicked on the See compatible devices list, thinking maybe it was their new 600Mhz but it brought up a 1900Mhz list, which the Pixel 2XL should be able to handle. John is a very good marketing guy. He’s very good. What they deliver and what he touts are two diferent things when it comes to coverage improvements. Maybe they’ve fixed the national, widespread issue of calls just disappearing (rings on the callers end, but nothing on the recipients phone, at all) and texts that are delayed somewhere in the satellites for hours or days. Huge forum discussion on TM support site. Happens to us all the time, but random. Would sure be nice to have reliable calls and texts you can count on! I’m thinking of what it could be that nobody would miss if it were gone (based on the teaser video). I think they will decommission 2G. Especially because there is 3G, 4G, and newbie 5G. Who will miss 2G ? Not me. Everyone who has 2G service will be probably upgraded to 3G for free. Hopefully the grandfathered Simple Choice Subscribers are eligible for a 3G upgrade. I currently get 2G unlimited Internet after going over my alloted 7GB tether allowance…. it would be nice to get unlimited 3G instead of the slower 2G. At Mobile World Congress 2017, Neville Ray talked about shutting down T-Mobile’s 3G network in 2019/2020 and being exclusively 4/5G. He said they still had some 2G running, but it was almost exclusively for machine-to-machine communications, like for vending machines and parking meters, not for cell use. Not really “uncarrier” though. IIRC Verizon has done it already? How about 100% US Based Customer Care!! Bring the jobs back home! Stop sending calls overseas! Not sure if the Customer Service teams will be 100% USA based, but you were probably one of the only people to predict the uncarrier event was Customer Care oriented! Nice Job!!! The customer service will NOT be 100% US Based. I’m an employee of T-Mobile, and I had zero insight into what this uncarrier move would be, but I had a feeling it would be something customer service based. I hear every single day I work, about 10 times, complaints about how terrible our overseas calls centers are, mostly the complaints are targeted about the significant language barrier and the time wasted by re-explaining things to the international rep. The way the overseas customer service will work is if the US Team of Experts has longer than a few minute hold time, the call will go to an overseas Team of Experts, as well as if the customer calls after regular business hours, which I think is after 9pm. I really wish T-Mobile would listen to their customers about this pain point. Our overseas call centers make so many errors, and the US Workers are the ones that have to fix all of their mistakes. The sad thing is T-Mobile is not growing their US Rep headcount by any significant means, and instead, all of the growth in the representative headcount is going to 3rd party contractors, most of them overseas. T-Mobile puts on a good presentation about how we’re improving things in customer care, but, more and more, our customers are getting international call centers. I’m concerned that if the merger with Sprint goes through, that trend will only continue to grow. We tried T-Mobile for 3 months and had to go back to Verizon as we were getting daily dropped calls in various locations, no coverage at all inside retail stores, and completely missing calls at home. Been a long time Tmobile customer and looking to switch to the biggest network. The prices are now very close to make this happen. It used to be much more expensive at Verizon, not anymore. Telling you to switch to Verizon..lol I think my Tmobile days are over with seeing Edge network showing up briefly yesterday. It’s 2018 folks. They can spew all the bs they want. Maybe it’s no limits on tethering? If there’s a cap before throttle on “unlimited”, why would it matter if you want to burn through your data by tethering vs “normal” cell data use? Data is data. this was the worst uncarrier event ever….seems like TMO is moving backwards.